Amazon Reviews for Big and Bright! I gotta admit it’s cool to see my book on Amazon and it just got better now that it’s actually been reviewed. Only two so far, but they were both very positive. I don’t know the first reviewer, but I love what he wrote. Very nice detail about the book. The second reviewer is Texas Bob. As some of you know, Texas Bob wrote THE book documenting details about every HS football stadium in Texas. When I first announced my tour in 2012, he sent me a copy of his book and it sat on my passenger seat for those five months. You can link to his Texas Stadium data base on my Texas football links page or see his website here. Thanks to both LSmith and Texas Bob for the fine reviews. It means a lot whenever a Texas HS football fan thinks I “get” what the culture of the sport is all about. More than 25 years ago, America was introduced to the culture of high school football in Texas in Friday Night Lights. 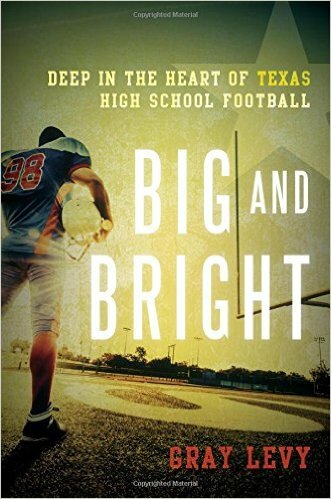 While that book was very popular in the description of one football program, Big and Bright takes that concept and expands it even further. In this comprehensive book by Gray Levy, football programs from all over the state of Texas are described in great detail. Levy uses his experience as an educator and a football coach to write about various programs in the state, both in geographic locations and in size. No matter which program he writes about, from Port Lavaca on the coast of the Gulf of Mexico to Albiline in the central portion of the state, Levy writes about the players, the coaches, the games and the community support for each of these football teams. Through Levy’s writing, the reader will be caught up in the spirit of the town and understand why the communities will support these young men fervently. Also, the experiences of the coaches and the players are captured in each town. This was one of the better aspects of the book, especially when Levy writes about what the coaches would be doing not only on game night, but during the week and during school time as well. Levy’s experience as a coach and educator make his writing very informative for the reader as well. He also shares his opinion on both the education system and coaching frequently in the book. He does explain why he has these opinions and backs them up with experience or facts as appropriate. One example of this that I enjoyed is when Levy states that he believes that “in general, Texas coaches are less authoritarian than coaches elsewhere.” He then goes on to write about examples illustrating why he believes this. Passages like this make the book very enjoyable to read. The football passages are detailed, deep and very descriptive. Whether it is a description of the offensive formations, the game action for the week Levy visited the school, or the recap of the season for that program, these sections are rich in description. Football fans that love the game beyond the action on the field and want to know more about the strategy and the “X’s and O’s” will especially enjoy these parts. This book should be added to the library of football fans of all levels, even if they don’t normally watch high school football. Readers who like books on social interaction and the human aspect of sports or gatherings will also want to read this as well. It was a book that I enjoyed very much and was a very good read. I wish to thank Taylor Trade Publishing for providing a copy of the book via NetGalley in exchange for an honest review. This was not a quick or easy read as the story for each school’s football program that Levy wrote about was described in great detail so it required careful reading. Fans of high school football will enjoy this book as all aspects of high school football programs are covered in each chapter. Readers who have an interest in the sociology of high school football in Texas and how it bonds entire communities will also enjoy this book. When I first heard that a Reno, Nevada high school football coach was coming to Texas for the 2012 football season to find out what Texas High School football was all about, I was skeptical. A long list of writers, journalist and sports writers from out of state have come to Texas to “see” High School football with their own agenda and to show us the error of our ways and our miss placed emphasis on Football in our educational institutions. In the end, they just didn’t get it. Coach Gray Levy came to Texas with an open mind. He didn’t come to see football in Texas, he came to live it. It did that by doing several things right. First he spent time in rural Texas and urban Texas. Second, he stayed close to each of the eleven teams for at least a week. Third, he became part of the team’s community. And lastly he included teams from six man football to the largest classifications. Big and Bright by Gray Levy is a good read for football fans. It takes you in the locker rooms of Texas high school football all across Texas. If you don’t understand Texas High School football this book will help you get it. After reading “Big and Bright” I believe Coach Gray Levy gets it. I’m watching Cal-Texas on TV and recognize a familiar name from my travels in 2012. Jared Heard is now making an impact as the QB for the Texas Longhorns. I saw him play several times in 2012 and ’13. The first , with a sideline view during a playoff game against Aledo on the day after Thanksgiving. …It’s cold and windy at the Northwest ISD Stadium in the Fort Worth suburb of Justin the day after Thanksgiving when the Bearcats take on Denton Guyer. Guyer is the No. 1 ranked team in Class 4A. They’re led at quarterback by University of Texas verbal commit Jared Heard. During the 2012 regular season I was on the sidelines and pregame locker room for 11 games. During the postseason I added 17 more. I was probably in more playoff locker rooms than any man in the state of Texas. It was a great opportunity, few ever get, to compare team preparation. By now, I could sense the mood in the room. Most often, coaches acted confident, talking about who and where they’d be playing in the following round, as if this game is a foregone conclusion. Wins didn’t always follow those shows of confidence, but usually teams expected to win. Twice during the season, however, I caught a different pregame vibe and both times the outcome was a loss. It isn’t as though the coaches expect to lose. It’s more a message coming across that losing is a distinct possibility. When talking about the future, the answers aren’t ‘When we win…’ but ‘If we win’. Good coaches never lie to themselves about the situation they face. Optimism is great but coaches must be realistic as well. I don’t know if this attitude helped cause the loss or if the coaches simply scouted well enough to know trouble’s coming, but the feeling is unmistakable. Aledo’s staff knows this could be a long afternoon. Guyer scores on their first drive, three and out for Aledo, another Wildcat score, another Bearcat three and out followed by a quick Guyer strike and the score is 21-0. The Bearcats have had just six offensive plays and are down by three touchdowns at the end of the first. About halfway through the second Aledo gets on the board with a 15-yard touchdown pass to Willie Gibson to make the score 21-7 at the half. The Bearcat offense looks tentative and sluggish. The Bearcat defensive front has trouble figuring out Wildcat quarterback Heard. Big and strong and running the zone read, Heard is the type of quarterback this scheme is built for. The quick Aledo front have hesitated on their rush, worried about losing contain and letting Heard scramble for big gains. This gives Heard time to find receivers. …“Let’s go, LETS GO! !…LETS GOOOOO!! !” McGuire yells as he steps on the artificial turf at Longhorn Stadium Monday afternoon. “We’re going to have a GREAT DAY!! !” As the music is turned up, he grabs various players in headlocks and bear hugs, looking like an excited kid on Christmas morning. The enthusiasm of a Longhorn practice is something to see. Music is always blaring, coaches are dancing as they run drills and players are encouraged to be loose and have fun between reps. Good-natured trash talking is common and the defense celebrates when making plays vs. scout team. McGuire came from Crowley to Cedar Hill in 1997 as an assistant under a coach with a more disciplinary style. The ‘Horns had talent but poor numbers and didn’t play with much emotion. McGuire decided to do things differently. Football can be a grind, full of routine and tedious repetition; the season is a long slog and practices aren’t always fun. Only 31 when he got the head job in 2003, McGuire was the youngest head coach in the Texas 5A. He immediately implemented his philosophy, part of which included trying to make the day-to-day fun. Seeing a few players and coaches get “Magged,” I can attest it’s something to witness. If it were possible for smoke to come out of ears, it would happen here. McGuire looks like he’s going to come out of his skin. For all the anger, however, McGuire hugs and loves on his players much more than he chews on them. His fury dissipates as quickly as it rises and everyone seems to know the outbursts aren’t to be taken personally. …The new coaching style paid off quickly. After McGuire arrived, numbers in the program steadily rose and the Longhorns began winning. In 2005, Cedar Hill made their first playoff appearance since 1994. In 2006, the Longhorns went 16-0, winning the Class 5A championship. Since 2005, the ‘Horns have made the playoffs every year, never failing to survive through the bi-district round. When Texas was admitted into the union in 1845, the United States Congress offered the new state a unique option. If the legislature ever chose to, the state was given permission to separate into five separate states, thereby increasing its representation in congress. Texas Pride being what it is, the likelihood of this happening is remote, but the option exists. In essence, Texas is a borderland where four separate cultures meet. The American Southwest enters from the west, the Midwest from the north and the South from the east and Mexican culture from the south. Texans from other parts of the state hardly recognize South Texas as part of the United States, much less Texas. Every Texan loves San Antonio, but the triangle of land to the south of Alamo City is described as North Mexico as often as South Texas. At the bottom of this triangle is the Rio Grande Valley, often referred to within the state simply as “The Valley.” One cannot go further south and still be in the United States. West and south of the Valley is the Rio Grande River, and Mexico; east is South Padre Island and the Gulf of Mexico. To the north, 250 miles of sparsely populated farmland and desert separates the Valley from San Antonio. The Rio Grande Valley is isolated from the rest of Texas in many ways. Part of this isolation has to do with race and nationality. The Valley is nearly 90 percent Hispanic; Anglos are a distinct minority, a fact the rest of the state is well aware of and cause of the commonly held view that the south isn’t quite Texas at all. The cities of Brownsville and McAllen on the American side and Matamoros and Reynosa on the Mexican side form, in effect, an international commerce zone. …The Valley’s an outlier from a football perspective, as well. The coaching community in South Texas is largely self-contained. Rio Grande Valley coaches rarely leave for jobs elsewhere, and coaches from other parts of the state don’t often make South Texas part of their circuit when climbing the ladder. On the rare occasions when coaches from “up Texas” make it to the Valley, there’s a perception they come with an attitude that they know better than the locals how things should be done. “He thought he was going to come down here and show us all how things ought to be done.” This outsider lasted just two years, “He thought he was in Mexico…not South Texas,” the Valley coach says resentfully. 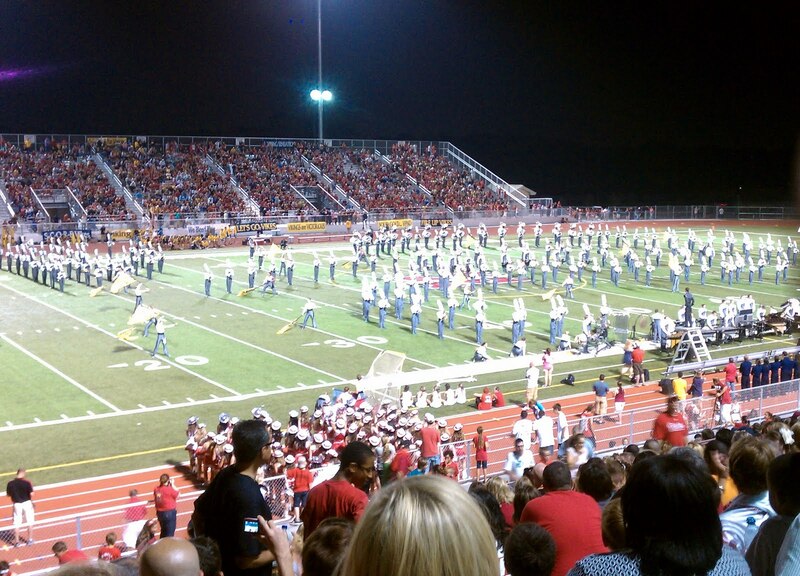 …One week isn’t enough for me to understand the love and hate of Harlingen High School in the Valley, but it’s long enough to know that any rivalry involving the Cardinals involves deep feelings. In their 100th year of football, the Cardinals have been a major Valley power for generations, regularly winning district championships and embarrassing opponents. Harlingen has had only four losing seasons since 1970; they’ve made the playoffs 12 straight seasons and have won 10 or more games the past four years. This much success can lead to jealousy, arrogance and resentment, words I heard repeatedly from locals inside and outside the program. Most Harlingen coaches are alumni of the school. Successful programs often take the structure of a family and use it as a rallying point. Most often this family is a seasonal thing, changing each year as coaches’ move, kids graduate and new members join. At Harlingen, the family connections are real and deep. Been home from Germany over a month now. I’ve made some decent progress on the book. Going through the notes reminds me of all the great times I had over there. What a wonderful experience it was living and working with all my friends overseas. Here is a little of the first draft. …Now at 46, the toll football left on his body is permanent. Mille has a limp and wears a knee brace during activity. Today, his skiing will end early when the pain becomes too bothersome. Mille’s body’s paid a price for his years in pads, but he maintains the game gave back more than it took. After a bad knee injury in 1997, most thought Mille would never play again. While in the hospital, he looked at his life and decided to make changes. Returning home, he vowed that he would play again and committed to getting back on the field. Mille was also in an unhappy marriage and determined it was time to make a break and got a divorce. ’97 was a bad year for the Razorbacks as well. The youth program was depleted and they lost every game. After the season the team suspended play. 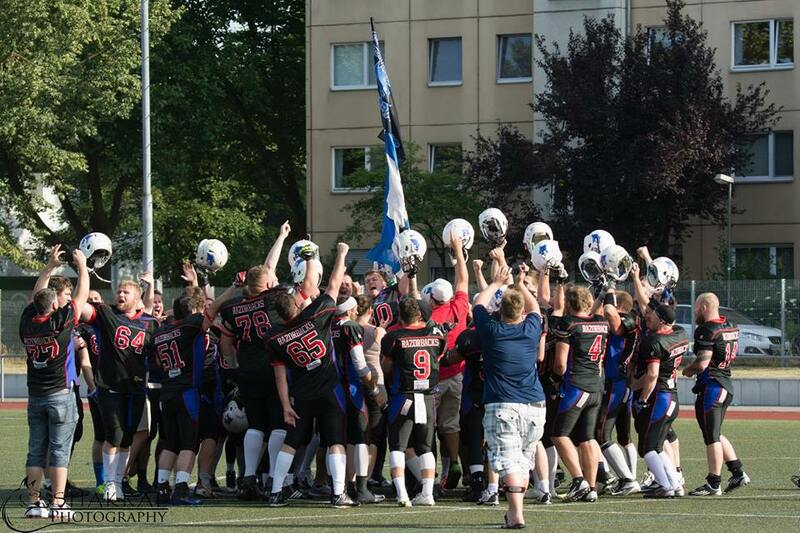 Left without a team, several Razorbacks joined the Konstanz 89ers in 1998. After a grueling rehab, Mille returned to play O-line for the 89ers. In 1999, the Razorbacks were re-established and the former Razorbacks returned home. It was a great year, the team won the 5th division championship and Mille, now at linebacker, played well. “It changed my life.” Mille says about his ordeal. Football showed him he could achieve anything if he works for it. He made tough decisions and through determination and discipline, is happier than when he began. What he says is familiar. I know from personal experience that football builds boys into men and teaches life skills not taught in a class room. It did for me. Though the circumstances were different, I look back on several places where football changed my life for the better. I first learned about commitment and toughness as a high school player, achieving my goal of becoming a starting guard despite my 5-4 stature. During my divorce, coaching probably kept me from going crazy, giving me a purpose. Building character is the main argument for athletics in the American school system, (A very strange concept to most Europeans.) Except for major colleges and the NFL, football in the US is almost always about character training. Players may enjoy playing, but the effort and commitment serve different purposes. Here, football and athletics are not supposed to build character. In Europe, sports are simply about exercise and fun. People play football, soccer, team handball or ride bikes or skateboards for fresh air and to enjoy a beer or cigarette afterwards with friends. Coaches don’t preach life lessons after every practice as many do in the US. Educational Euros aren’t allocated here to instill discipline, that job is left to parents. In Europe, schools teach academics and job skills, not character. That Mille credits football with teaching him to be a better person comes as a surprise. It tells me that even when character building isn’t a direct goal, it inherently exists in football. It’s never preached here but teamwork, discipline, toughness and commitment are so ingrained in football that it rubs off on players whether playing for semi-pro teams in Europe or an American high school. As someone who loves the game for its intellectual challenges and beauty, as well as for the lessons it teaches, Milles’ testimony is exciting. I came to Europe hoping to recognize the game in a way I could understand and here it is. Maybe, football does translate outside North America in ways I hadn’t expected. After a tough few years I’m excited to see the Tigers look to be back on track, dominating their first two games. Go Tigers!!! …Craig Chessher is an “Old Texas Ball Coach” I’m told. It’s said as a compliment, but also to describe a throwback from an earlier era. Some practices are better left in the past. Old-school coaches often didn’t allow water breaks, believing dehydration built toughness. Creative illegal recruiting methods such as paying high school players, and boosters buying families homes to attract blue chip players were common during much of the 20th century. Coaches ignoring kids’ injuries and other old-school abuses are mostly long and well gone. Texas high school football has been played and documented for more than 100 years. The traditions that made the sport great aren’t modern inventions. Many are rooted deep in the past. Just as there are many ways to move the ball there are many different approaches to coaching. Some head coaches are hands on, putting themselves into every aspect of the game, planning, coaching a position and running drills during practice. Others focus on one side of the ball. Some are disciplinarians and others are CEOs. During my time here, I’ve seen many approaches. With Chessher I would see a method and style with a long tradition in Texas. Round Rock is in the fastest growing part of the state. The town has blown up over the past 20 years as part of Austin’s metro boom. The I-35 strip between DFW and San Antonio is increasingly the center of Texas’ population. This comes as no surprise to anyone on the freeways around suburban Austin. There are good reasons for the traffic and growth, though. The area surrounding Austin is a desirable place to live. Austin itself is an exciting town, with the university, good job opportunities and great nightlife. It’s also the gateway to the Hill Country, the most beautiful part of Texas, with nice little towns, rolling hills and inviting rivers. In north Round Rock, amid suburban subdivisions, Stony Point High School isn’t especially remarkable. The campus is nice but nondescript. The athletic facilities are functional, but not extravagant. Round Rock ISD has five high schools. At one time it was a one-school district, but is growing rapidly. It’s generally accepted that the fewer schools an ISD has to support, the stronger that support is. The Stony Point Tigers rolled between 2007 and 2010, making the playoffs four straight years and advancing to the final four in class 5A three consecutive times. However, with so much growth in Round Rock, demographics, zoning and enrollments are volatile. It’s a common pattern in booming parts of Texas. Schools open as 3A programs and are quickly bumped to 5A as new housing explodes. Zoning lines move and the cycle repeats. Whether the adjustments help or hurt a particular school is unpredictable. When Stony Point opened in 2000 it threw a monkey wrench into a three-high school ISD. Nine years later, Cedar Ridge High opened and Stony Point had the wrench thrown back. Cedar Ridge is just a few miles away and boundaries for Stony Point were redrawn. …The dividing line of big and small school Texas football, is between 3A and 2A. 3A’s and above are only differentiated by the number of quality programs in their level. In 2A and smaller however, the game is different. Fewer coaches do more, player’s play both sides of the ball and huge percentages of students participate. Idalou High has about 300 students, and like Throckmorton and Stamford, the elementary school and middle schools are very close. Also as with other small schools, each high school coach has responsibilities with younger kids. Idalou has five football teams, (seventh, eighth, freshmen, JV and Varsity) and the eight high school coaches have responsibilities with every lower team. When I show up late Monday morning, middle school and freshmen athletic periods are in session. Idalou has good freshmen turnout. Thirty two freshmen play football and work alongside the middle school kids during athletics. The JV has 34 players and the varsity 37, adding up to a grand total of 104 high school players. Not bad for a school with only 300 students. High school principal Janet Thornton tells me 90 percent of the students are involved with at least one extra-curricular activity. After freshmen athletic period, the varsity and JV are up. Long, acting as offensive coordinator, and defensive coordinator Mark Turner met with the varsity inside, going over the scouting reports while the JV performs the same lifting workout the varsity did Saturday. The rest of the staff helps Lofton supervise the workout. The scouting reports are simple; the Wildcat approach to both offense and defense is straightforward, line up correctly and win with better skills and strength. There is only one defensive automatic, a coverage based on the back-set of the Mustangs. After the meeting, the varsity players head out for an offensive field chalk followed by special teams and offensive individuals. The varsity wears green practice jerseys and helmets; the JV has white helmets and jerseys. When the entire program is outside the freshmen can be recognized by their white helmets and green tops. Athletic period ends at 12:45, and everyone returns to the school building for afternoon classes. The varsity wears shells afterschool while both JV and freshmen are in full pads. The program has great numbers, but the school has a small coaching staff. Very few, if any, 2A programs have the personnel to platoon. The coaches and players all have both defensive and offensive responsibilities. After a quick stretch, everyone breaks into seven defensive position groups, five by varsity position and separate JV and freshmen groups. The groupings change at 4:05, the varsity defense combines and works against two offenses running D-City plays, a varsity scout unit and the first JV offense. Across the field, the second JV “O” runs live plays against the freshmen defense. The contact in practice is inversely correlated to experience. Varsity contact is rare, but the JV backups and freshmen hit quite a bit, learning how to use their pads. After defense, the three teams switch to offense, first individuals then team, and two varsity huddles run plays back to back. Long stands between the two huddles so he can oversee both units. The Wildcats’ offensive scheme is part of the old-school vibe of this program. No spread offense here. Idalou relies heavily on the power running that’s carried them to 13 consecutive playoff appearances and a state championship in 2010. The “I” with two tight ends is their base formation. The philosophy is time-tested; create push up front and pound the ball with the running game to set up the occasional pass. …There is some truth to the claim that six-man is difficult to find, at least for suburbanites outside West Texas. The six-man game is played almost exclusively in very small towns, not Abilene small or even Stamford small, but towns with only one stoplight– like Throckmorton, a crossroad of two-lane highways connecting four slightly larger small towns, a blinking red light strung up where the highways intersect. …Throckmorton has only 63 students and seven teachers, so the young football coach is not only a HC/AD but also teaches a full load of classes. As well as running football, Reed is a basketball assistant, head track coach and teaches Physical Education to students from kindergarten through the high school. How exactly is six-man football different? • 15 yards for a first down instead of ten. • Conversions are switched; one point for getting the ball into the end zone from scrimmage, two for kicking it through the uprights. • All six offensive players are eligible to catch passes. Because this means the whole defense must be in coverage, an exchange is required before the ball carrier can run (No QB runs or scrambles.) In some six-man offenses, the tailback is effectively the quarterback, having the nominal quarterback pitch him the ball, letting the tailback either throw or run. • The playing field is only 80 yards long and more narrow than a 11-man field with just 13 yards from the hashmark to the sideline. Gameplay is different. With so much field for the defense to cover, six eligible receivers and so few defenders, scoring is very quick. Davis tells me that the goal of his defense is to force the offense to run seven plays to score, counting on the offense to make a mistake somewhere along the way. A well-executed offense will score no matter the quality of the defense. As the best basketball defense gives up baskets from time to time, six-man football defenses give up touchdowns. Scores can reach triple digits and it’s rare for a winning team to score under 50 points. The basketball comparison is apt. Six-man football defense, more than anything, resembles a violent form of basketball zone defense. So much open field results in several consequences. Each defensive player is exposed and can be isolated, often creating mismatches where weak defenders are exploited. Small schools usually have at least one weak defender, giving the superior team a tremendous advantage. Games between solid teams and those with weaknesses often quickly become lopsided, so the game has a mercy rule. Since the Greyhounds began playing six-man in 2004, as many games have ended early as have gone four quarters.